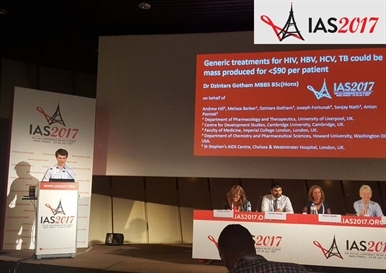 HIV, hepatitis B and C and tuberculosis (TB) can each be treated for less than $90 a year where generic drugs can be made available, Dzintars Gotham of Imperial College, London, reported at the 9th International AIDS Society Conference on HIV Science (IAS 2017) in Paris on Tuesday. Although the cost of antiretroviral treatment has fallen dramatically since generic manufacturers first began to manufacture versions of antiretroviral drugs in India in 2001, generic products have not been available in all countries due to patent restrictions. Over the next few years it will begin to be possible to provide first-line treatment for HIV using generic drugs as patents expire on some of the key drugs used in HIV treatment. The cost of treating other diseases remains extremely high in most countries, and is affected not only by patent restrictions, but also by the ability of governments to negotiate competitive prices. Dr Gotham said that the cost of treating hepatitis C with a 12-week course of sofosbuvir and daclatasvir ranges from $108 in India and $174 in Egypt, to $11,598 in Australia, $29,361 in Brazil and $47,972 in Argentina. To achieve global targets for HIV treatment and viral suppression, hepatitis C elimination and reducing the burden of TB and drug-resistant TB, large increases in the number of people treated for each disease will be necessary. Cutting the prices paid for medicines will be essential if countries are to afford large treatment programmes for HIV or viral hepatitis. In particular, countries that are seeking to move to treat-all targets will have to have keep up with the growth in newly-infected people, Dr Andrew Hill of Liverpool University told a symposium on how to reduce drug costs. The number of people who will need HIV treatment is likely to grow at a rate of 800,000 a year, from 30 million in 2017 to 36.4 million in 2025, he pointed out, while the current rate of hepatitis C infections means that the global burden of disease will remain the same at current treatment levels up to 2030, the target date for elimination of hepatitis C.
To find out what scope might exist for further price reductions, Dzintars Gotham and researchers from Howard University, Washington DC, St Stephen’s AIDS Trust, London, the University of Liverpool and the University of Cambridge looked at costs of shipments of active pharmaceutical ingredients (API), the raw material of drug manufacture, in and out of India. Until November 2016 information on the value of shipments of APIs was freely available from the India customs service. The research group used these costs and added manufacturing costs calculated from a range of published and unpublished sources, and added a 10% profit margin. Their prices did not include the costs of bioequivalence studies for regulatory approval or transport. They found that there is scope for further reductions in the costs of several widely used antiretroviral drugs in lower and lower-middle income countries, and also showed how far higher-income countries can expect to reduce treatment costs as antiretroviral drugs begin to go off patent over the next few years. High-quality regimens for the treatment of each disease can now be produced for less than $90 per course of treatment or per year, and there is no need for governments or donors to pay more, provided that intellectual property restrictions can be overcome. Countries and donors should aim for a new $90-$90-$90 target on HIV, viral hepatitis and TB drug prices if the current global targets for disease elimination are to be achieved, he concluded. The lack of accurate information on current prices – and potential future prices – is deterring governments and donors from scaling up treatment for hepatitis C, speakers at the symposium on drug pricing agreed. “Donors need to understand just how cheaply these drugs can be made. It’s misleading for Gilead to say that they can offer sofosbuvir for $900 when we’ve shown that it can be made for $90,” said Andrew Hill. Governments also need to adopt a tougher stance in price negotiations and start thinking in terms of their strategic aims for public health, several panellists argued. Gotham D et al. Generic treatments for HIV, HBV, HCV, TB could be mass produced for < $90 per patient. 9th International AIDS Society Conference on HIV Science, Paris, abstract TUAD0104, July 2017.